TrakkaSystem’s superior searchlight and camera technology is designed for both covert and overt operations. Should your mission be border security, forward observation posts, insurgent identification, long-range stand off surveillance, ambush or IED detection, whether mobile or static, then Trakka Systems has you covered. Trakka Systems’ world-class range of camera products is as sophisticated and reliable as our searchlights. 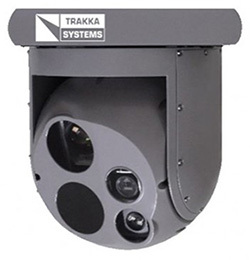 TrakkaCam products are a range of ITAR-free, highly gyro-stabilized single or dual LRU gimbals for Surveillance and Utility Inspection applications. Our internal payloads are fully configurable and are designed to match sensors with mission parameters to ensure mission success. All of our systems can be interfaced with secure data link and moving map capabilities. These attributes enable operators and command centres to share mission critical information in real time whilst providing enhanced situational awareness via augmented reality overlays or pure synthetic views. 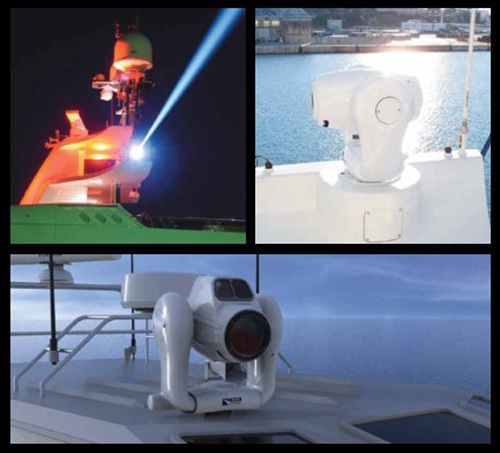 Our optical sensors are augmented with video processing and night vision enhancements allowing users to see through fog, haze and complete darkness. 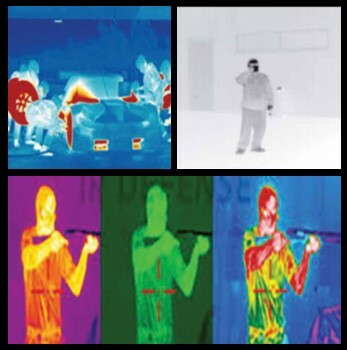 Our inbuilt software can also blend images to exploit features from different sensors providing imagery of activities that otherwise would go undetected. To meet changing mission requirements our systems are easily tailored with interchangeable universal mounts for land and airborne surveillance applications. Advanced, weatherproof construction allows the TrakkaCam to perform under the harshest environments. All of our systems are designed to meet DO-160 requirements with materials that offer the highest strength to weight advantages. Trakka’s Integrated Optronic Solutions (IOS) are a family of highperformance, integrated vision-enabling solutions built around Trakka’s gyrostabilised camera systems. They are specifcally designed for integration into armoured vehicles, and have been developed for advanced Situational Awareness, Route Clearance and IED Detection capability. Trakka’s IOS provide a decisive tactical advantage by delivering safe and superior stand-off ISR capability for the APC crew from within the vehicle, whether static or on the move. 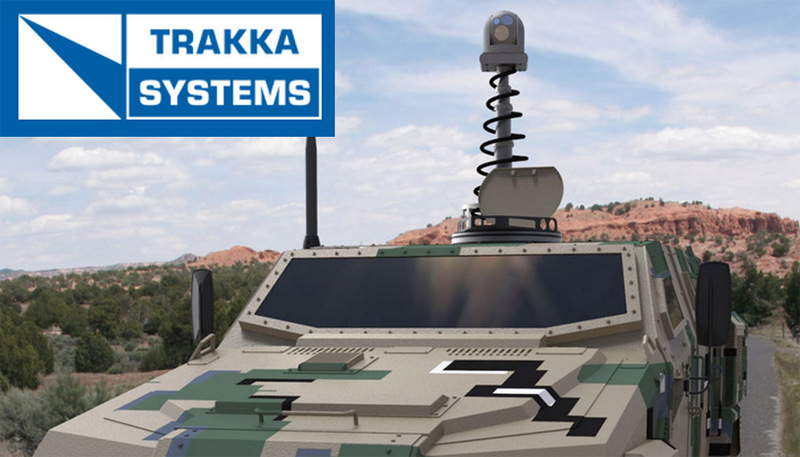 Trakka IOS can be integrated with advanced complementary detection systems using adjunct technologies including ground-based radar, Electronic Warfare, acoustics and unattended ground sensors. This provides full multispectral situational awareness which can be combined with command & control systems plus appropriate communications and effectors to manage the threat environment. 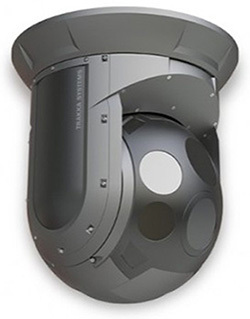 The TC- and SWE- LE series of multi-sensor surveillance products offers para-military and military users with a choice of land and airborne imaging solutions within three sizes of gyro-stabilized gimbals. All sensors and components are completely ITAR-exempt and are widely exportable. The TrakkaBeam searchlight represents a complete – and positive – turnaround in searchlight engineering and design. Our amazing TrakkaBeam completely eliminates the legacy issues and inefficiencies of traditional searchlight technology. TrakkaBeam’s unique design and rugged construction guarantee the highest proven Mean Time Between Failure (MTBF) in the industry. With its sleek, aerodynamic styling, low power draw, low weight, superior mission functionality and reliability, TrakkaBeam has become the enviable benchmark in aviation searchlight performance. Right around the globe, ground, airborne and maritime law enforcement, security forces, search and rescue and other agencies all rely on the TrakkaBeam searchlight system to achieve their critical mission objectives.